Responding to the accelerating challenges of our time—endless war, environmental destruction, and a financial system that works for fewer and fewer of us—a global movement for fundamental change is gaining momentum. Quickened by the Arab Spring, the ongoing May 15 movement in Spain, the grassroots uprising in Greece, the student movement in Chile, the month-long occupation of the Wisconsin capitol earlier this year, and many other campaigns chronicled on this site, we are entering a period where the potential for sustained and urgent people-power to tackle the monumental problems facing the planet is growing. “Sustained” is the watchword. While the one-day protest will continue to be an important tool in the social change toolbox, organizers are increasingly turning to multi-day, multi-week, and multi-month campaigns. They cast a vision of sustained action—and then see if people will say “yes” to it using the most powerful language they have at their disposal: their own bodies. So far they have. Recent cases include the two weeks of civil disobedience at the White House in August (where 1253 people were arrested opposing the Keystone XL tar sands pipeline) and the Occupy Wall Street action that has now entered its third week and is spawning similar actions across the nation. And now, beginning today, thousands of people are launching an ongoing nonviolent occupation of Freedom Plaza in Washington, DC. “October 2011,” while pegged to the tenth anniversary of the US war in Afghanistan, has a much broader goal than ending this war. 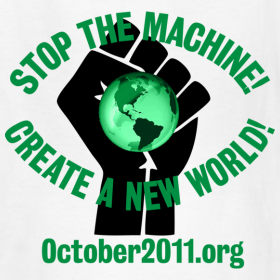 It seeks “a democratic, nonviolent transition to a world in which people are freed to create just and sustainable solutions,” and lists 15 core issues that it calls on the country to face, including the runaway power of corporations, deepening US militarism, the criminal justice system, and equal access to quality education. Ongoing nonviolent action is not easy to sustain. The timing has to be right, the context has to be right, and the organizing has to be right. Sometimes the situation is so immediate and life and death that it can light the spark for sustaining such action, against all odds, like the ongoing weekly nonviolent protests in Palestine. In all cases, sustained action requires a deep commitment, a vision, and a willingness to enter the roller coaster of emotions and perceptions—from elation, connectedness, and the power of doing something truly meaningful to fear, boredom, and the creeping feeling that this doesn’t matter at all. If things move together in the right way, the action may contribute to a political or cultural shift for the good. At the same time, long after the event is over, we can savor the power of connection and significance we experienced together there. Often rooted in a vision that transcends ourselves—the healing of ourcommunity, our society, our wounded and sacred world—this action can itself offer an experience of healing and transformation. We recognize that we have been part of an enduring struggle for justice that has been deeply immediate and gritty, and at the same time deeply symbolic of the world we long for. How, though, can we cultivate this sense of commitment, solidarity, vision, and a willingness to take up the roller coaster of enduring action for change? One way that October 2011 has nurtured this is by asking people to take a pledge. On the one hand, one can see such a pledge merely as an organizing device. On the other hand, the power of such a device is rooted in the depth and potential of such a commitment. Daily the pledge was repeated at the evening meeting, and processions through the city carried banners exhorting workers to keep the pledge. When the owners offered terms lower than those stipulated in the pledge, the workers’ refusal to work became a genuine strike. Moreover, Gandhi organized a pledge of nonviolent action to resist the hated anti-sedition Rowlatt Bills that proposed to continue martial law in India after World War I. There are many examples of pledges being used to organize nonviolent action. A Call to Resist Illegitimate Authority, written and signed by Dr. Benjamin Spock, Marcus Raskin, William Sloane Coffin, Mitchell Goodman, and Michael Ferber, was a commitment by the signers to support draft resisters during the Vietnam War and a call for general resistance to the war. I have been involved in two pledge campaigns: The Pledge of Resistance and the Declaration of Peace. Seeking to end US wars in Central America in the 1980s, 100,000 people took a pledge to engage in nonviolent civil disobedience or other forms of nonviolent witness. Between 1984 and 1990, thousands of US citizens were arrested for nonviolent action as part of the Pledge. The scholar Christian Smith has documented the effectiveness of this campaign in his book, Resisting Reagan: The US Central America Peace Movement. Since then, a number of “pledges of resistance” have been organized—including one focused on the US war in Iraq and another one concentrating on climate change. The Declaration of Peace was a campaign in which thousands of people committed themselves to take action backing a declaration calling on the US to create a comprehensive plan to end the US war in Iraq. It organized a series of events across the nation from September 21-29, 2006, which contributed to making the Congressional elections six weeks later a referendum on the war. The DOP campaign continued for the next few years. Pledges can be effective vehicles for organizing and mobilization. At the same time, their power is rooted in the commitment of each pledge signer to withdraw consent from injustice and violence and to support nonviolent options. Such personal commitment is needed now more than ever. As this crucial season of broadening action unfolds, each of us is being asked: What will I commit to in order to build a more just and peaceful world? What pledge will we write, sign, and deliver on? Let’s see if I agree with the 15 core issues in order to take this pledge. DISAGREE as pie in the sky fantasy. DISAGREE. The US Constitution is the supreme law of the land. 7. Criminal justice and prisons –end private for-profit prisons, adopt evidence-based drug policy, prisoners have the right to humane and just conditions with a focus on rehabilitation and reintegration into society, abolish the death penalty. DISAGREE with most of this and abolishing the death penalty. 11. Environment – adopt policies which effectively create a carbon-free and radio-active free energy economy and that respects the rights of nature. DISAGREE. Sorry, not a fan of censorship. DISAGREE with the food network drivel. So, I’m 0-15. Doesn’t look like I’ll be taking this lunacy. I think the whole point is that none of these are actually ‘rights’. But they sure should be. Sign me up for a better world.